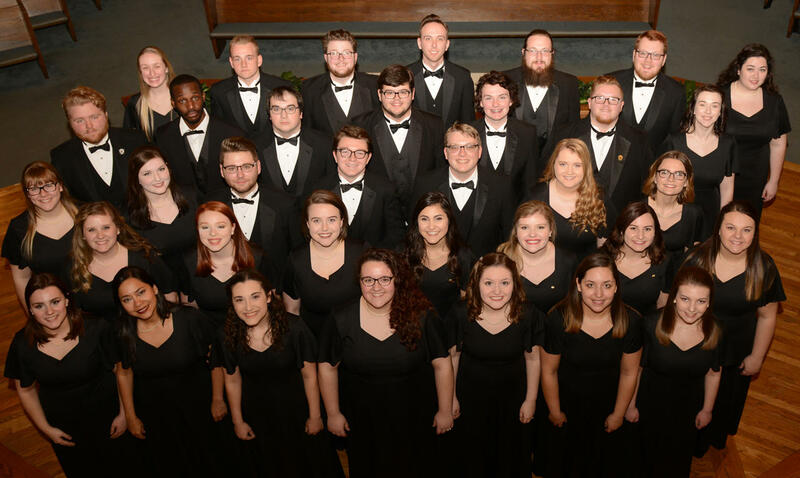 After showcasing their vocal talents earlier this month in Pikeville, the Morehead State University Concert Choir and Chamber Singers will return to Morehead to give audiences a treat. The vocal groups will present a concert with dessert at 7:30 p.m. Tuesday, April 23, at First Baptist Church at 123 East Main Street in Morehead. The program is entitled “Sheltered by a Rock During Life’s Storms” and is a fundraiser for the choir’s tours. Desserts and coffee will be served at the conclusion of the concert. Admission is $5 and free for children 6 and under. The 35-voice MSU Concert Choir and 12-voice MSU Chamber Singers are conducted by Dr. Greg Detweiler, professor of music at MSU. The program features an extended composition for organ and choir by Morten Lauridsen featuring MSU staff accompanist William Murphy on organ and two traditional spirituals for baritone and choir featuring Dr. Eric Brown, assistant professor of voice at MSU. The concert choir will conclude the evening with a beautiful Irish ballad, “An Oíche (The Night),” followed by two energetic spirituals that summarize the theme of the program. Dr. Eric Brown will join the choir for Alice Parker and Robert Shaw’s “My God is a Rock” and “I Got a Home in-a Dat Rock” by Moses Hogan. The award-winning MSU Concert Choir and MSU Chamber Singers represent the University on regional, national and international tours. Recent trips have included tours to Spain, Italy, Ireland, Hungary/Austria and Costa Rica.